To help you choose luggage for your family’s needs, I’ve written a review of the best luggage sets currently available. I look at what sized pieces are in each set, what the features of the luggage pieces are, and tips on how to choose the best luggage set for your family. I’ve chosen to review the top rated luggage sets currently on the market. When traveling as a family, packing can be a nightmare, and there’s so much more to pack than when you’re traveling solo. If you need to take a few luggage pieces with you, then investing in the best luggage sets might be a great option instead of buying individual pieces. Most of the larger luggage brands have luggage sets that feature a few different sized luggage pieces. 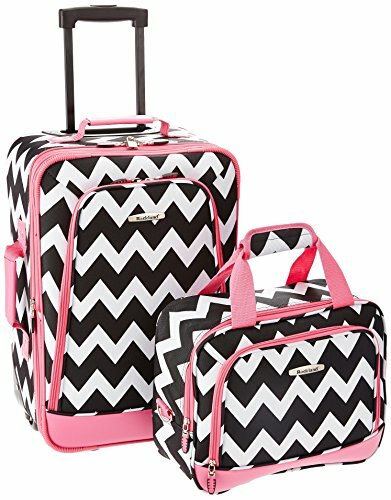 These luggage sets are great for large families or for those moving overseas and needing to pack lots of things. 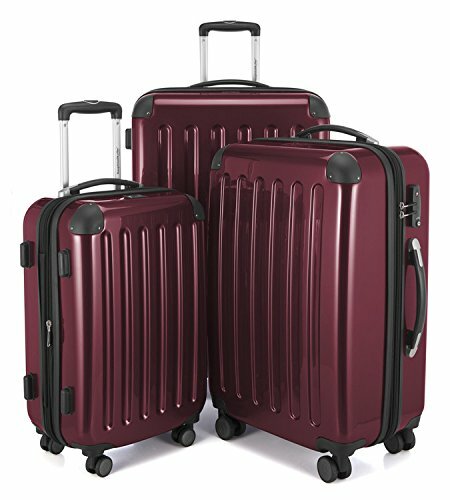 A very popular luggage brand, Rockland offers a great 2-piece luggage set for those wanting a carry on piece as well as a larger piece to check in. This set is great for a solo traveler or a couple, and is even suitable for longer business trips. The set is stylish, and comes in a range of colors. I like that the pieces are expandable, which is handy for those times when you seem to end up with extra souvenirs and bits and pieces to pack that you didn’t have when you left home! There are two different-sized pieces in the Rockland luggage set. The larger piece is a 28 inch piece that measures 28 x 17 x 12 inches, and weighs 10lbs. The smaller piece, suitable to use as a carry-on luggage piece, measures 20 x 13 x 9 inches, and weights 6lbs. Both pieces feature 8 multidirectional spinner wheels, which makes it a breeze to move the luggage around at the airport and while in transit. You’ll like the durability of this set- it’s made of ABS polycarbonate, which gives it a sturdy and clean look. It’s simply to keep your luggage set clean- simply wipe it down with a damp cloth. If style is important to you, then you’ll be happy to know that the Rockland luggage set comes in 38 different color combinations to choose from! You can choose to blend in with everyone else, or maybe choose a color that really stands out on the luggage carousel! The interior of the luggage pieces have zip, mesh and elastic pockets for easy compartmental packing and to keep everything nicely organized! The pieces also have a chrome telescopic handle that can be pushed up and down easily with the press of a button. There is a 3-year warranty on the luggage set. The Rockland Santorini luggage set is similar to the standard Rockland luggage set, except for the design, style and warranty available. This is a set for people who prefer something that looks stylish, classy and durable. 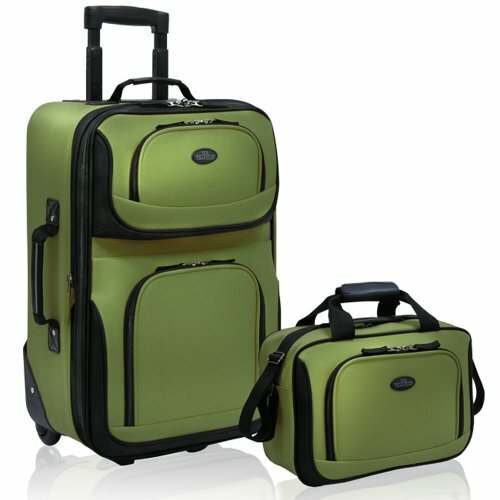 You’re not a person who likes brightly colored luggage, so a set that comes in plain, simple colors is more your style. 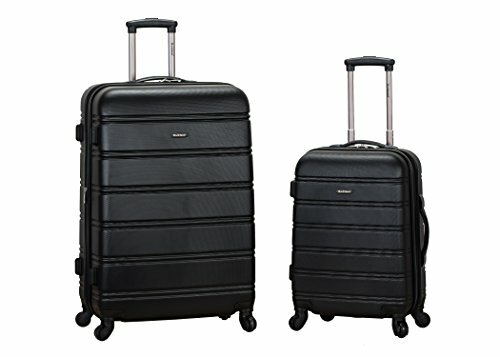 The luggage set features a 28-inch piece that measures 28 x 17 x 12 inches and weighs 10lbs. The smaller, carry-on piece measures 20 x 13 x 9 inches and weighs 6lbs. You’ll be impressed with the 8 multidirectional spinner wheels that makes it simple to glide your luggage around without using much physical exertion. The cases are made of ABS polycarbonate and feature a stylish ribbed design. Luggage natural scratches and has marks on it over time, so the ribbed design does a great job of disguising these marks. The interior has a zip, mesh and elastic pocket so that you can separate your items and find them easily. I was impressed that the Rockland Santorini luggage set features a 5-year warranty, which is slightly longer than the warranty on the standard Rockland luggage set. What I love about a 2-piece carry-on luggage set is that it’s the perfect option for people who prefer to only travel with carry-on, but need more than one carry-on luggage piece. The pieces are made of soft 1200 denier polyester, with an EVA padded front panel for extra protection. To keep the luggage clean, simply spot clean. There are carry handles on the top and sides to help you carry your luggage easily. The interior is fully lined and has an adjustable tie-down strap to keep your belongings in place. The upright luggage piece has inline skate wheels, and both pieces have corner protectors. What I love about the Rockland set is that it comes in a range of different fun colors and patterns, so this set is perfect for kids, teens and anyone who loves a splash of color! The exterior is made of 600 denier polyester with an EVA lining for extra protection. It has stability poles at the bottom to prevent the luggage from falling over when standing upright. It has telescopic handles for easy movement when in transit. 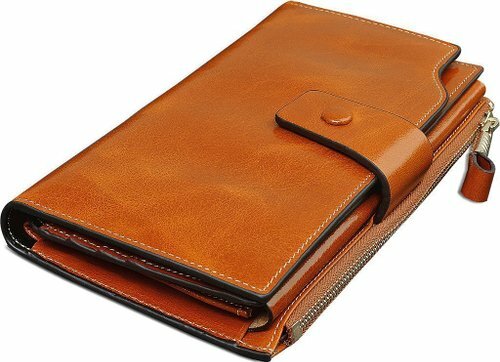 The interior has three organizational pockets. There are inline skate wheels, and I like that the luggage can expand by up to 2 inches. The Monaco set is a stylish set with two pieces that can attach to each other, making it easy to move the set around when you’re in transit. The exterior is made of polycarbonate with a ribbed design, making it stylish and clean-looking. The interior has a fabric lining. 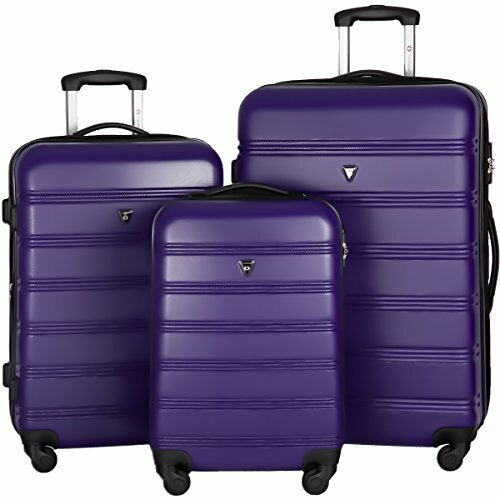 There are eight multidirectional spinner wheels, which is more than most other luggage sets! There’s also a TSA-approved lock. For traveling families, a 3-piece luggage set is more useful than a 2-piece luggage set. I’ve chosen the top rated luggage sets that have 3-pieces, and have chosen some of the best brands currently on the market. I’m a huge fan of Delsey Luggage, as you may have seen from my Delsey luggage review post. The Delsey Luggage Helium Sky 2.0 is available as a set of 3 luggage pieces which is great for traveling families. It combines French style with clever design and features for travelers that are looking for more than just a basic luggage set. There are three luggage pieces in the Delsey Helium Sky 2.0 set: 21 inch carry-on, 25 inch piece and 29 inch piece. The luggage pieces are made of soft, micro ballistic polyester with a vapor barrier to help protect your luggage from getting wet. It also has reinforced corners to prevent ripping and tearing, something that happens quite often when traveling with luggage. There are three outside zippered pockets, and the front pocket has a soft touch lining so that you can store your electronics here! The fully lined interior has tie down straps to keep your belongings safely in place. It has two zippered pockets and a wet pocket. The 25 inch and 29 inch pieces also come with a suiter clip so that you can clip your suit and keep it protected and neat. You’ll be impressed with Delsey’s 10-year worldwide warranty! American Tourister is a very popular travel luggage brand, and has a wide range of pieces available for the budget traveler. I’ve chosen the Fieldbrook II 3-piece set because it’s a top rated and great selling set on Amazon. The smallest bag in this set is a boarding bag, which is slightly smaller than a carry-on bag and can fit under your set. It measures 15 x 10 x 8 inches. The other two pieces measure 21 x 14 x 7 inches and 24.5 x 16 x 8 inches. The exterior is made of 100% polyester with reinforced corners to prevent ripping, while the interior is fabric lined. There are 2 inline skate wheels, and you’ll be pleased with the 10-year warranty available. The American Tourister Pop Spinner is a great luggage set by a trusted and well-known brand. This set is different to the Fieldbrook II set because it doesn’t have a boarding bag but a larger carry-on bag. The exterior is made of 100% 600-denier polyester with a nylon interior lining. There are four multidirectional spinner wheels that makes it easy to move your luggage around without using much physical force. Simply use the telescopic handle to guide the luggage around. 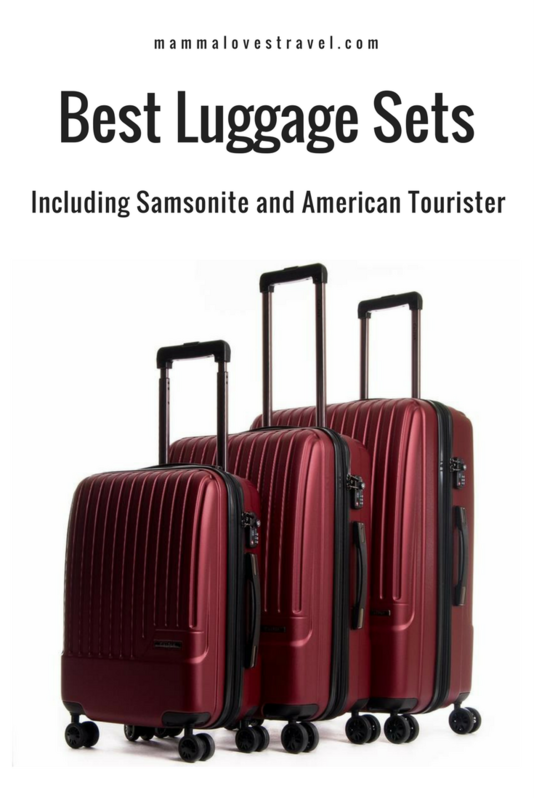 Samsonite is a top-rated luggage brand known for its high quality luggage pieces. I chose the Winfield 2 Fashion Hardside set because it’s a best seller and is packed with features that you’ll find helpful when packing for an overseas vacation with your family. The exterior is made of 100% polycarbonate with a ribbed design to disguise any scratches or scuff marks over time. The design looks stylish and sleek. The interior has a fully-zipped interior divider and cross straps which help your belongings in place once you’ve packed them. This is a great way to separate your belongings and organize everything according to how you prefer it. You’ll love that the luggage pieces are expandable by up to 1.5 inches- great for stuffing your bags with those last minute souvenirs and purchases! There are 4 multi-directional spinner wheels to make life ease when you’re moving your luggage around the airport. The warranty is a 10-year limited warranty. 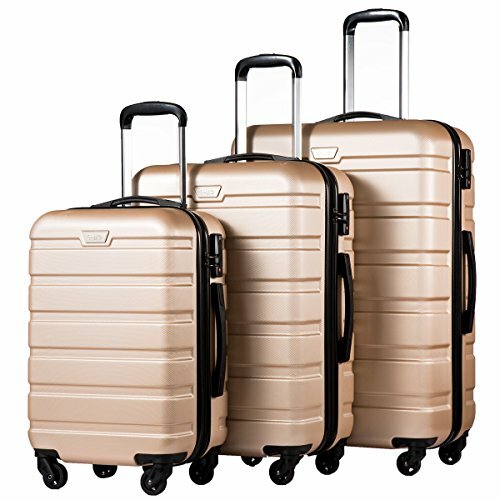 For those who don’t have the budget to splash on an expensive luggage set, the Merax Dreamy luggage 3 piece set is a great choice. These measurements include the wheels. The luggage pieces are made of a combination of polycarbonate and ABS material, making this a lightweight yet sturdy luggage set. The interior of each pieces is fully lined and features multi-use organizational pockets, cross straps and zippered pockets. This is an expandable set, meaning that each luggage piece can expand by an extra 1 inch. The 2-year warranty is shorter than most other luggage sets. 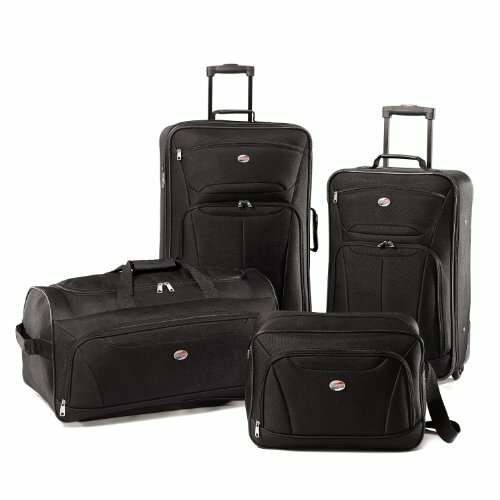 The U.S. Traveler New Yorker 4 piece luggage set is a great choice if you’re looking to get the best luggage set for families or if you’re traveling with a lot of items (such as when you’re moving to a new location). I’ve chosen to review the U.S. Traveler 4 piece set because the set offers a great range of pieces at an affordable price. The exterior is made of a durable fabric known as “dobby”. The exterior front panels are made of EVA foam, which gives a clean, sophisticated appearance. The interior is lined in light gray fabric, and has tie-down straps, a zippered mesh pocket and dual shoe pockets, which is a great idea for families! Traveling families will also appreciate that the pieces can be expanded by up to 2 inches. The luggage pieces have inline skate wheels with corner protectors to help the wheels last longer. At the lower end of the budget scale is the American Tourister Fieldbrook II 4-piece set which I’ve chosen to review because American Tourister is a popular and well-loved luggage brand. I’ve also chosen this set for families that can’t afford to spend much on luggage. Each luggage piece is made of 100% polyester and comes in a range of different colors. The price of the set depends on the color you choose- the neutral, darker colors are more expensive than the lighter, brighter colors. I really like how this set has reinforced corners, because I find that the corners are the first part of a luggage to become damaged and worn out. The interior has fabric lining and interior pockets to help you with your organization. The largest luggage piece (known as the 25-inch piece) is expandable. Each piece has inline skate wheels. The warranty period for each luggage piece is different. This is the best luggage set for family travel, because it has a number of different pieces that you can use for different family vacations. Whether you’re taking the family away for a weekend, or on an overseas vacation, this set is convenient and made for large families. The smaller bags can be used by your kids for summer camp, or for overnight sleepovers. When buying luggage, it can be hard to choose the right set- you’re not sure how many pieces of luggage you’ll need. But something I’ve noticed is that not all vacations are the same- sometimes you travel somewhere where you need lots of items, while other times you travel somewhere where you can get away with packing lightly. If you have a family, sometimes your kids will go on vacation or camp with their school, and they might need a large luggage piece and some smaller toiletries-style packs. This is when it’s handy to buy an 8-piece luggage set such as the Traveler’s Choice Amsterdam set. The exterior of each luggage piece is made of two-tone polyester fabric, which is 1200 denier and 600 denier. The interior has a fabric lining, and features cross straps and dual shoe pockets. The wheels of the luggage pieces are inline skate wheels. 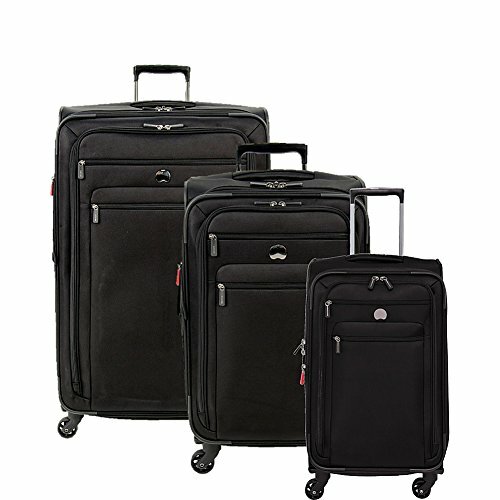 If you’re looking for the best luggage spinner sets, then the following sets are a great choice. Their pieces all have spinner wheels, making it easy for you to manage your luggage while moving through an airport. The Hauptstadtkoffer set comes in a range of stylish, glossy colors- you can choose from one of 31 different colored sets! The luggage pieces are sturdy and are made of ABS polycarbonate, with a ribbed design to disguise any scratches or scuff marks. Each piece in the set has telescopic handles, TSA-approved locks that can be reset, and four multi-directional spinner wheels for ease of use. The interior is fully lined, has cross straps to help hold your items in place, and has a flexible divider pad with a separate mesh pocket. What I really like about the German brand is that it features a limited lifetime warranty on its luggage pieces! Great for peace of mind! Expensive price, but you may be able to find it on sale? 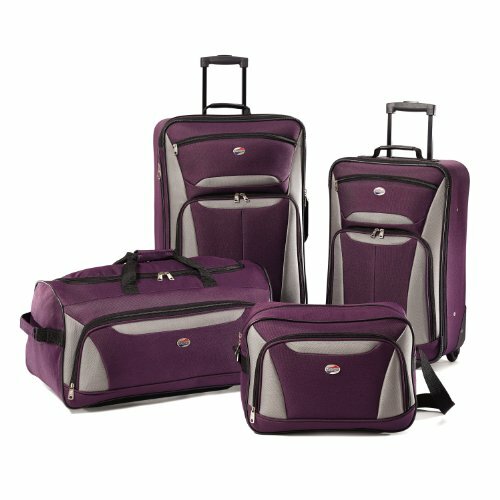 The Coolife luggage set is a very popular set, and comes in either the 3-piece set or the family 4-piece set. I’ve decided to review the 3-piece set. The exterior is made of sturdy ABS material, while the interior is lined and has a mesh zippered pocket that’s elasticized, as well as cross-straps to prevent your things from being thrown around in the luggage while in transit. 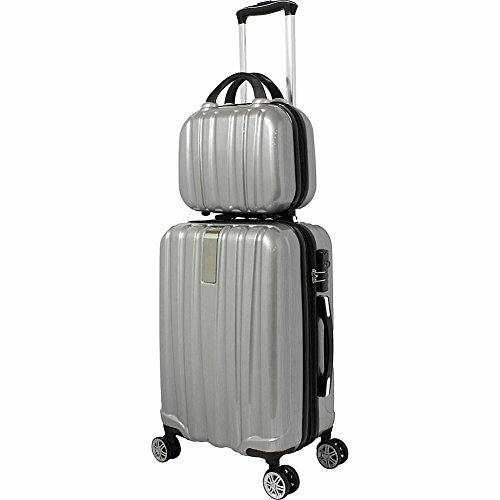 There are multidirectional spinner wheels on each luggage piece, as well as a combination lock and telescopic handle. I chose the Merax Travelhouse luggage set because it’s currently listed as “Amazon’s Choice” and is a popular and well-reviewed luggage brand. The pieces all have telescopic ergonomic handles, and are made of polycarbonate ABS material. The interior of each piece is fully lined and you’ll find cross straps and a zippered pocket to better organize your belongings while packing. Of course, this set has 4 multidirectional spinner wheels to make it easier for you to move around. Buying a luggage set with different sized luggage pieces is often more economical than buying individual luggage pieces. Once you have your set, you can choose to use the most suitable piece each time you travel, without having to buy a new luggage piece each time. 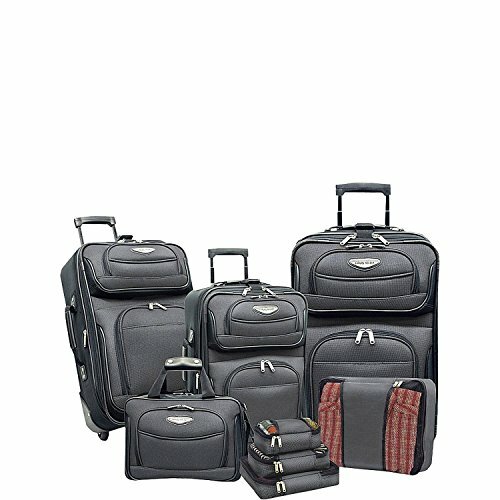 You can often find the best luggage sets on sale or at discounted prices. Your luggage needs will change depending on where you are traveling to and how long for. If you’re just going away for a weekend, then a duffel bag or a small backpack might be enough. If you’re heading overseas, then you’ll need something larger. Rather than buying a new luggage piece every time you are traveling, buying a set means that you’ll have different sized pieces for different trips. Buying a luggage set means that all of your luggage pieces will have a similar style. They will be the same color and have the same design, and most of the features will be the same for each piece in the set. Having similar looking luggage pieces makes it easier to find your luggage on the carousel at the airport. When you’re not using your luggage, storing it at home can be a problem. Having a luggage set means you can nest the pieces in each other when you’re not using them. Nesting empty luggage pieces is great when you need to take empty luggage with you when you’re going shopping somewhere fun, like Hong Kong or New York City! Not all luggage sets are the same. There are some things you need to think about before choosing the best luggage set for your travel needs. 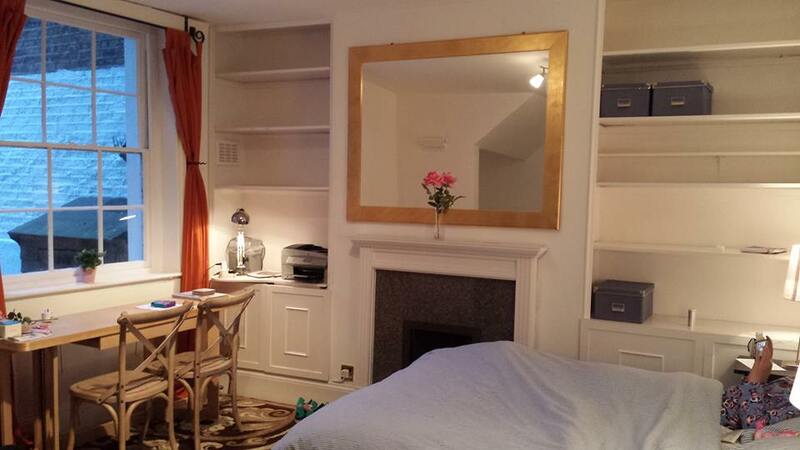 Look at each luggage piece in the set, and ask yourself whether you will use the pieces in the set. Do the pieces suit your travel needs? Are there any pieces in the set you will never use? It’s important to find the best luggage set that you will use. There’s no point buying a set if half of the luggage pieces won’t ever be used. You might as well buy individual luggage pieces! Look at the sizes of the luggage pieces in the set and how much they can carry. Will this be enough for your family vacations? Are you flying and need a small bag to fit under your seat? Can you find a set with such a small piece? Think about the types of vacations you take before you make your choice. If you’re taking a few pieces of luggage with you, then luggage with spinner wheels will be much easier to move around an airport than luggage with inline skate wheels. Check that the luggage has handles that are easy for you to lift the luggage with. Some smaller luggage pieces are designed to slot over larger pieces for when you’re moving around an airport. Whether you choose hardside luggage or not is a personal preference. Hardside luggage is often more lightweight and sturdy, however is still prone to scuff marks and scratches. It’s easier to keep clean than soft luggage, and hardside luggage looks more stylish. Soft luggage can be expanded easily, however often rips and tears. Compare the price of buying a luggage set with buying individual luggage pieces, and choose the option that’s most economical for you.